If you have fallen in love with your Windows Phone 7 handset, there is every chance that you want to know more about the phone, the platform, new apps and news concerning the platform. There are various ways in which you might do this: for instance, you could spend a bit of time on the web visiting various popular websites such as Engadget or Windows Phone Central, or you might configure RSS feeds to be fed through to your preferred Windows Phone RSS feed reader. You might even setup email alerts in Google that will let you know when something of interest has been written about Windows Phone 7. For the best results, however, your best bet is to head to the Windows Phone Marketplace where the following six apps are available exclusively. These tools range from popular websites to developers forums and device manufacturers, and will certainly deliver all the information you really need to know about Windows Phone 7 direct to your WP7 device. The first app you should try is that of the big gun, Engadget, whose rapid fire release of tech and gadget news has made it the number one choice for such content on the web. 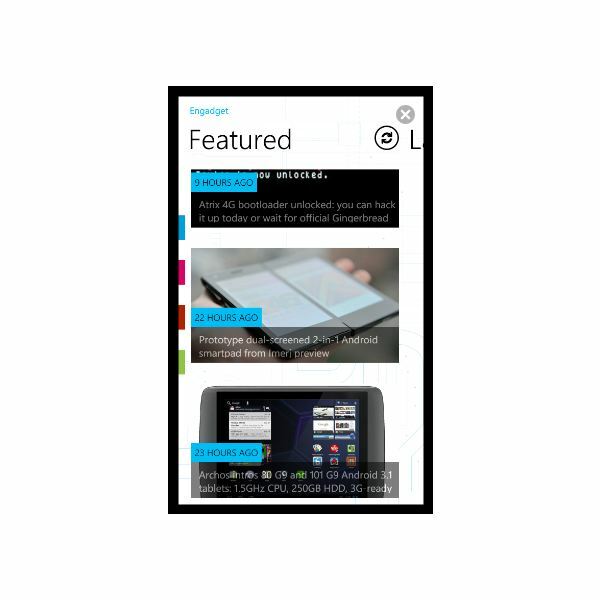 The free Windows Phone app delivers all of the same news that you would find on the website in a non-stop, daily stream with features, reviews and hands-on coverage alongside galleries of the latest devices. You can also take advantage of a mini browser and commenting tool to enjoy the website as if you were really there! Engadget for Windows Phone is official and free, and it even offers access to both the website’s podcast and their streamed video, The Engadget Show. 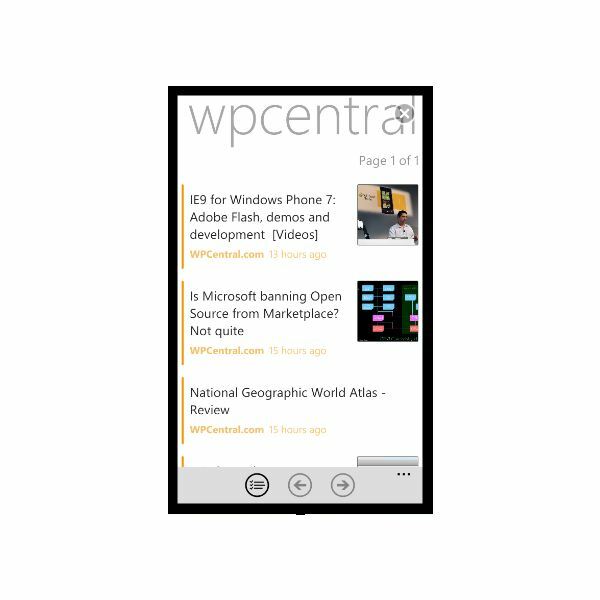 For those wanting the latest news for Windows Phone 7 from around the world, the WPCentral team has released this app full of news, tips and reviews, which they provide to readers to help them make decisions on whether or not to buy certain apps and games. Screenshots and video reviews are available via the app, and the app also offers sharing via SMS, Twitter and email. 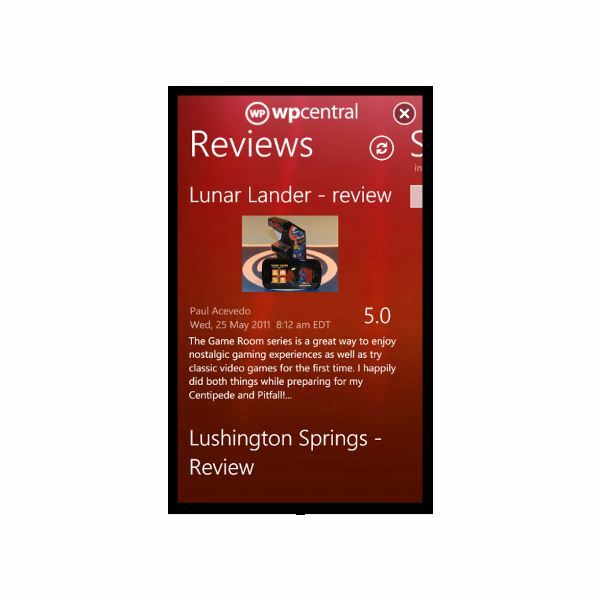 Most interestingly, the WPCentral app features live tile support, enabling you to stay up to date with what is going on via a Start screen tile rather than launching the app every few minutes. A trial version of WPCentral is available, and the full app is 99c. This free app doesn’t derive from a single website, but makes this list simply based on the great job it does of accessing the Windows Phone content from existing third party sources such as WMPoweruser.com and 1800PocketPC.com. There are ten quality news sources in total, each of which can be easily managed from the settings screen, and article sharing and Facebook wall posting are among the other features of Windows Phone News. In theory you might even forego installing any of the other apps in this list in favor of Windows Phone News, although bear in mind that this app doesn’t support video streaming and podcasts. One for HTC afficionados or HTC Windows Phone owners, this interesting app basically provides up to the minute news and information about HTC and their current devices. This includes news about which carriers will be selling the phones and tablets from the company, which new Windows Phone or Android devices are looking the most impressive, images of new hardware and various sharing options. While very much a niche app within a niche, the HTC app is free to use! If you haven’t heard of XDA-Developers.com then you probably never owned an Android or Windows Mobile phone before upgrading to Windows Phone 7. 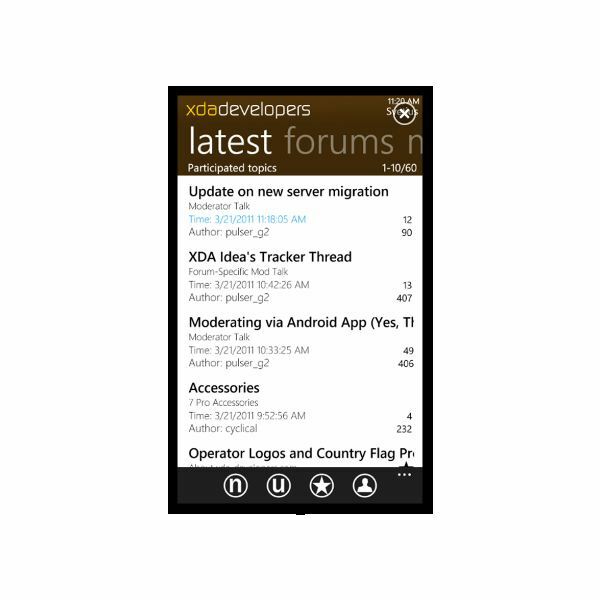 Their official XDA Developers Windows Phone app, available for 99c, allows the user to view the forums, read and reply to any interesting threads and also receive push notifications to the live tile whenever you receive a private message. While this might not sound particularly overwhelming, the XDA-Developers website is a massive community of amazingly talented developers whose hard work helped the old Windows Mobile platform last as long as it did. They already do great work in extending the capabilities of Windows Phone 7 (such as providing the means to unlock a handset) so if you haven’t already tried this site out, this app is the perfect way to do so. 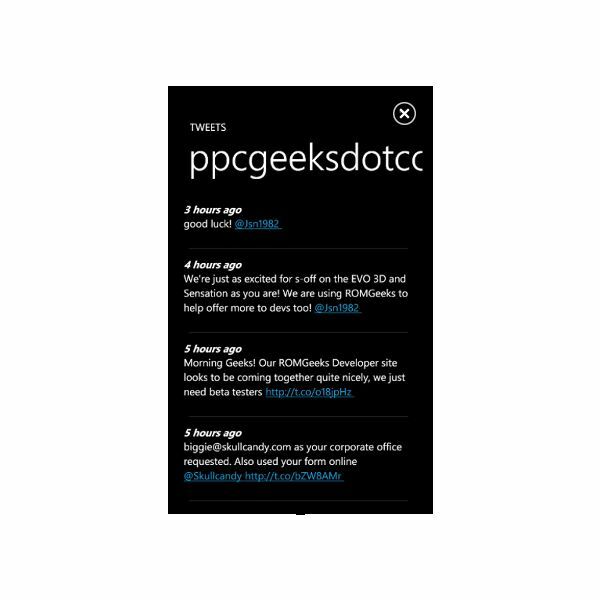 Finally, the team at PPCGeeks has put together a useful Windows Phone 7 app for accessing their RSS feeds for WP7, iPhone and Android news and updates direct from the website. Full articles appear in the app which is fully integrated with the much-loved Metro user interface. Posts are attractively illustrated on the summary screen and can be accessed by browsing the latest posts or checking the relevant category titles. The usual sharing tools for highlighting items on the PPCGeeks site via email, Twitter or Facebook are available, and best of all this app is totally free! All images and references via the Windows Phone Marketplace.